With touches of Liberace and Victor Borge, this world-touring US pianist/singer is a classical concert artist gone rogue. Combining virtuosic technique with vivacious comedy (and feathers), she covers Beethoven to Broadway, pop to Paganini, ragtime to rock'n'roll. 'A seasoned entertainer who has not forgotten how to entertain' (TheatrePress.com.au). 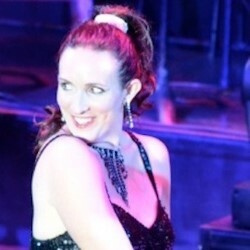 ‘Imagine if Bette Midler and Liberace had a love child... this woman can play the piano... with every part of her body!’ **** (BroadwayBaby.com). ‘From classical to blues... ragtime, Beethoven, ABBA, Van Halen, Jerry Lee Lewis, and back again!’ (RipItUp.com). 'One heck of a pianist' **** (TheatreGuide.com.au).